This was the caption to a panel of the popular tech webcomic found at XKCD.com. Also, these are words that terrify everyone in the telecom business. It’s no secret that millennials are far more comfortable texting rather than calling. Even Gen X and Y often avoid calls in favor of the less intrusive SMS. So how did we get to this point, and what can we do to fix it? Or, does it even need to be fixed? If, like the character in the hat, you have five phone numbers and you’re not sure what they all do, rest assured that there is a better way. And I’m not even going to tell you that Phone.com is the only answer! Truth is, any cloud telephony service provider worth its salt can give you a phone number, sometimes even a vanity number, that you can point all your numbers at, or forward to one number. 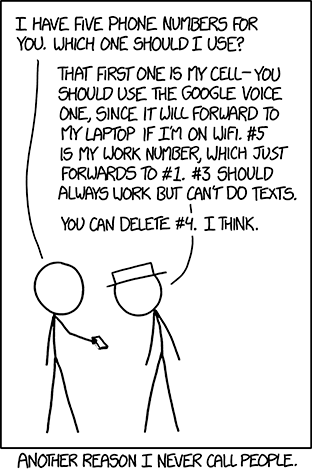 There are still some people out there who carry two phones with them everywhere they go, but cloud telephony eliminates that need by giving you as many virtual lines as you may want, and with the right feature set you give out one number and people can reach you no matter where you are, but thanks to call screening, schedules and menus, only on your terms. This one webcomic almost captures the entirety of the unified communications (UC) struggle, but not quite. To do that, you would also need a Skype name, a Slack handle, a Facebook messenger account and maybe a dozen other user names for a dozen other services. The forces supporting UC have been fighting for open platforms while Google, Microsoft, Slack, Facebook and everyone else are trying to put you in a silo. Though it may seem like the silos are winning, there’s no need to give your friends five phone numbers unless you think it makes you look cool. But, and here’s a pro tip, it doesn’t.